Iraq's government says it has begun an investigation into the alleged abuse of more than 170 detainees held by Iraqi security forces in Baghdad. The prisoners, many malnourished and some showing signs of torture, were found when US troops took control of an interior ministry building on Sunday. The US raid followed repeated enquiries by the parents of a missing teenager. Iraq's prime minister has promised to find those responsible for any abuse. Most of those held were Sunnis. The allegations are a deep embarrassment for the Iraqi government, says the BBC's Caroline Hawley in Baghdad. But she says however shocking, they will not come as a major surprise to many Iraqis. There have been persistent allegations of abuse by members of the Shia-dominated security forces, she says. But Sunday's discovery is hard evidence and officials believe it may be the tip of the iceberg. There are suspicions the building may also have been used as a base for a militia called the Badr Brigade, and that such militias may have infiltrated Iraq's security services, our correspondent adds. 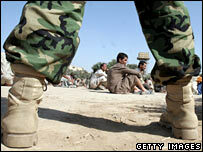 The prison is reported to be in the central Jadiriya district of Baghdad. Prime Minister Ibrahim Jaafari said he had been told that 173 detainees had been held, that they appeared malnourished, and may have been "subjected to some kind of torture". He launched an inquiry and said the prisoners had been moved and would be given medical care. Deputy interior minister Hussein Kamal, who saw some of the abuse victims personally, said: "I've never seen such a situation like this during the past two years in Baghdad, this is the worst. "I saw signs of physical abuse by brutal beating, one or two detainees were paralysed and some had their skin peeled off various parts of their bodies." 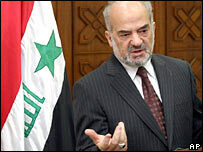 Dr Laith Kubba, a spokesman for Mr Jaafari, said the prime minister was putting all his weight behind the inquiry. "This is outrageous," he told the BBC's Newsnight programme. "It goes very much against the core values that the prime minister and his government hold." But he said methods used under Saddam Hussein had not been completely eradicated despite efforts to introduce new practices. Anne Clwyd MP, the UK government's human rights envoy in Iraq, said she had raised such allegations with Iraqi authorities back in May. "It is shocking what has happened," she told Newsnight. She said the UK had been trying to help bring about a cultural change by providing human rights training to Iraq security forces. "After 35 years of abuse, it takes a long time for people's mindsets to change," she said. The head of Iraq's largest Sunni political party said attempts to raise claims of torture in government detention centres had been rebuffed. "According to our knowledge, regrettably, all the detainees were Sunnis," Mohsen Abdul-Hamid, head of the Iraqi Islamic Party, told the Associated Press news agency. "In order to search for a terrorist, they used to detain hundreds of innocent people and torture them brutally." A US soldier who carried out the raid said: "It's not what we expected at all, we were looking for a 15-year-old boy." Farid Sabri, a UK-based spokesman for the mainly Sunni Iraqi Islamic Party, called for a UN-led independent inquiry into the allegations. "This is the tip of the iceberg," he told Newsnight. "We told the government about this months ago and they did nothing." Human rights group Amnesty International welcomed the investigation but said it should cover other allegations of torture and maltreatment by Iraqi police and security forces belonging to the interior ministry. The security forces have faced repeated allegations of systematic abuse and torture of detainees, and of extra-judicial killings. A report by pressure group Human Rights Watch earlier this year said methods used by Iraqi police included beating detainees with cables, hanging them from their wrists for long periods and giving electric shocks to sensitive parts of the body.